What makes America so special and different from most countries is that is was founded on Christian values. But one of the ways our founders followed through with their Christian beliefs was by swearing in the oath of any public office on the Bible. While there is no constitutional requirement for the use of a Bible while taking the oath, George Washington began the tradition with a Bible hastily grabbed from St. John’s Masonic Lodge No. 1 for his swearing-in on April 30, 1789, in New York. Since then, presidents have typically chosen Bibles with historical or personal significance, many using family heirlooms. But then something happened. Actually Progressivism happened. Recently a 26-year-old woman named Mariah Parker, became one of the newest African-American women to win a seat at the table. Parker was a hip-hop artist and doctoral student at the University of Georgia and beat her competitor by just 13 votes to become the District 2 Commissioner in Athens, Georgia. 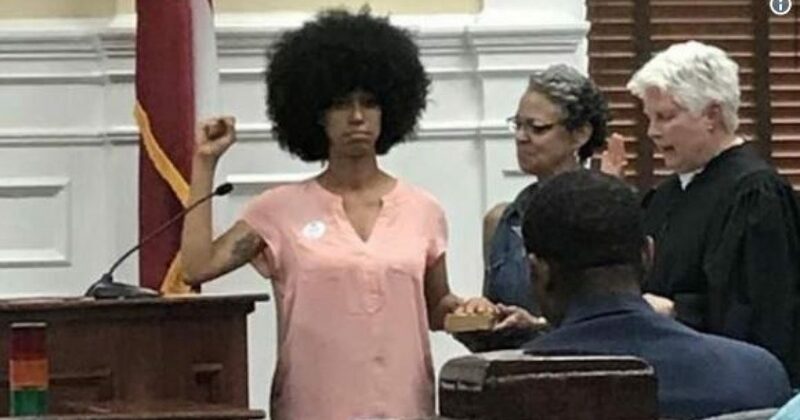 On Wednesday, she was sworn into office with her fist in the air and her right hand firmly placed on The Autobiography of Malcolm X. When did it become taboo to swear on the Bible? Perhaps a better question is why swear on a book by Malcolm X. Unless you’re an ethnocentric black racist. I guess she skipped reading the part where Malcolm X warned blacks in the 1960’s not to betray their race by voting for their oppressors. He was speaking of the Democratic Party. But surprisingly Parker isn’t the only public servant to swear on a book other than the Bible. Recall back in November 2006 when Democrat Keith Ellison won the election to the House as a representative of his Minnesota congressional district. Ellison was the first Muslim man to be a member of Congress and chose to take an oath to office on the Quran instead of the Bible. Since Tennessee replaced the Bible as the state book with 50 Shades of Grey, why not just swear in on that book of submission. To hell with tradition and Christian moral values. Let’s just make governing a free for all. After all, Obama did it. Under Obama, government certainly didn’t live by any Christian or even spiritual standards. That’s if you don’t count worship of Obama and the Progressive dogma. And where did that get the Democrats? We will know soon enough, however I suggest jail? The Founding Fathers believed that our rights and freedoms are God-given. Man can give you nothing. Man is fallible and corruptible. The Founding Fathers knew this of themselves, and warned the citizens to stay vigilant. So as Leftists swear on their dumb books, let’s keep clinging to our guns and religion.